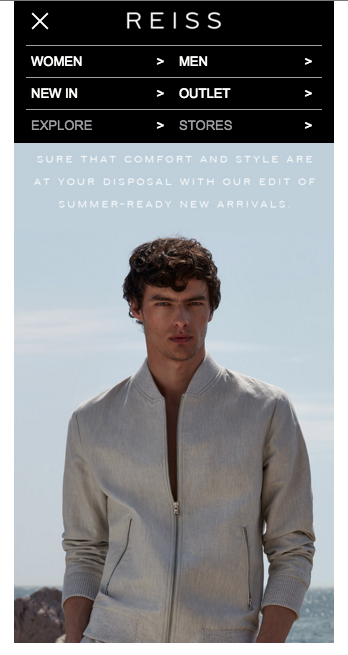 Reiss Email Navigation: How do they do it? 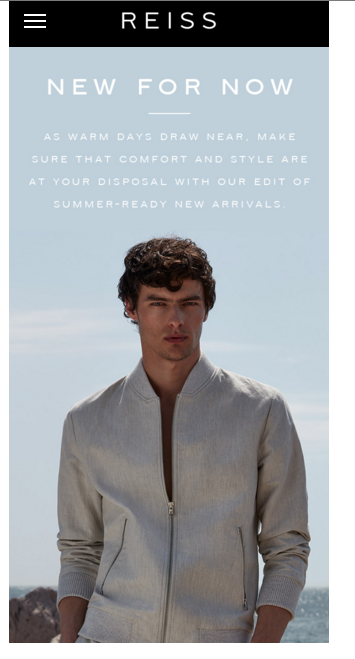 Has anyone seen Reiss emails on mobile, they have a navigation that drop downs... How are they doing? - didnt think possible on email, wonder how many email clients this works in? Yes it's a Hamburger menu, it has limited support and I try to sway clients away from it as there's years of user testing and analysis into it - and the results are rather horrendous I'm afraid. Although some are persistent and I have created a few in the past, they work by using several workarounds but rather than me explaining it I'd advise checking Remi's post for the FreshInbox link, it's very clear and concise. The only issue is that since this documentation was released we've had a gmail update along with several other new clients popup. So if you do want to implement this into your emails beware that the functionality(just as you've guessed) is rather poor but It will display and work on the Native Android and iOS mailing app which is a large majority of most subscriber bases. In terms of the gmail and inbox app, I've added some gmail and inbox specific hacks in order to hide the hamburger navigation and just show a stacked version of the desktop nav instead. It won't work on ANY desktop client, so make sure you have a nice robust and static navigation for those users AND one final thing, which everyone in the email community likes not to mention for obvious reasons... on the Outlook Webmail App (OWA) you cannot hide content AT ALL, so if you have a subscriber base with a decent amount of these guys, don't do it. As they'll see both the normal navigation and your burger navigation, on show, with zero functionality. FreshInbox has a lot of great ressources about interactive (or kinetic) emails. Check out these examples of hamburger menus : Hamburger’ Collapsible Menu in Email and Hybrid Collapsible Menu For Email.